In this section, you will create a new Java project. You will be using JUnit as your example project. JUnit is an open source unit testing framework for Java. First you need to download the JUnit source code. Click here to download the JUnit source code. Save the archive (do not extract) to a directory from now on referenced as <Downloads>. select "J2SE-1.4" in the Use an execution environment JRE field. 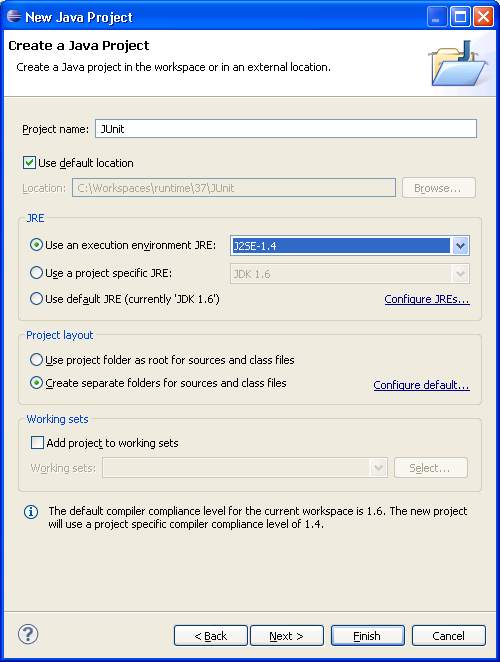 In the Package Explorer, expand the JUnit project and select the source folder src. Note: This step assumes that you followed steps 1 and 2 in the Getting the Sample Code section above. In the Import wizard, expand the root node, press Deselect All and select only the junit node. You can expand and select elements within the junit directory on the left pane to view the individual resources that you are importing on the right pane. Note: Do not deselect any of the resources in the junit directory at this time. You will need all of these resources in the tutorial. Make sure that the JUnit project's source folder appears in the destination Into folder field. Then click Finish. In the import progress indicator, notice that the imported resources are compiled as they are imported into the workbench. This is because the Build automatically option is checked on the Workbench preferences page. 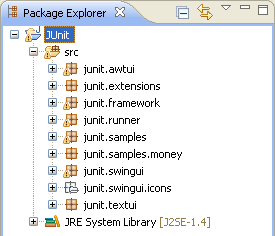 In the Package Explorer view, expand the JUnit project and the src folder to view the JUnit packages.